A conveyance of land in Arizona is made by a deed in writing, subscribed and delivered by the party granting the estate, or by the granting party's agent, authorized in writing (33-401). The grant deed is similar to a warranty deed but does not include additional guarantees. An Arizona grant deed implies some of the usual covenants of title, but not all. 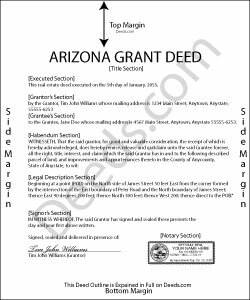 When the words "grant" or "convey" are used in a real estate deed in Arizona, the following covenants, and none other, are implied, unless they are restrained by specific words in the conveyance: (1) That previous to the time of execution, the grantor has not conveyed the property to anyone other than the grantee and (2) that the estate is free from encumbrances at the time of execution (33-435). A grant deed in this state will pass the after-acquired title of the grantor, unless an exception is made in the deed. Grant deeds must be signed by the grantor and duly acknowledged before an officer authorized to take acknowledgements. If acknowledgments are made in a state other than Arizona, they can be made before a notary public, a judge, clerk, or deputy clerk of a court of record, or any other person in the state authorized to take acknowledgments of deeds (33-501). A grant deed must be duly acknowledged in order to be recorded. A grant deed in Arizona should be recorded in the county where the property is located in order to provide constructive notice to subsequent purchasers and encumbrance holders for a valuable consideration without notice (33-411). Unrecorded grant deeds are valid between the parties and their heirs, and as to all subsequent purchasers with notice thereof, or without valuable consideration (35-412). A document evidencing the sale or other transfer of real estate or equitable interest therein should be recorded by the transferor in the county where the property is located and within sixty days of the transfer (33-411.01). Jing H. said: Excellent work. I have recommended some friends to your website and will continue. Thanks. Reply from Staff: Thank you Jing. Have a fantastic day!